All around the world, people were united in grief and shock as a fire engulfed the historic Notre Dame cathedral in the heart of Paris, with billowing smoke seen from miles away from the French capital's center.Hundreds gathered outside the cathedral, many in tears, as flames tore through the beloved building, causing the roof to collapse inward. French President Emmanuel Macron canceled a scheduled speech Monday to deal with the ongoing fire. "Our Lady of Paris is in flames," Macron said on Twitter. "Emotion for the whole nation. A thought for all Catholics and for all French. Like all our countrymen, I'm sad tonight to see this part of us burn. "Nicolas Marang, 47, has lived in Paris for more than 25 years and took video as Notre Dame's spire collapsed as the fire raged on. Marang told NBC News he was running along the Seine River when he saw the smoke, which looked like a "dark smog," coming from the Notre Dame.The scene outside the cathedral was "confusing and devastating," according to Marang. "Something just collapsed inside me. [It was] one of the worst things I've ever seen," Marang said. 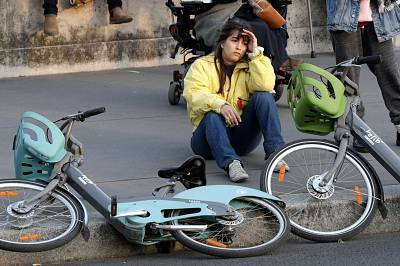 David Kang, 38, told NBC News he was on his way to his home in Paris when he passed by the Notre Dame and noticed the flames. 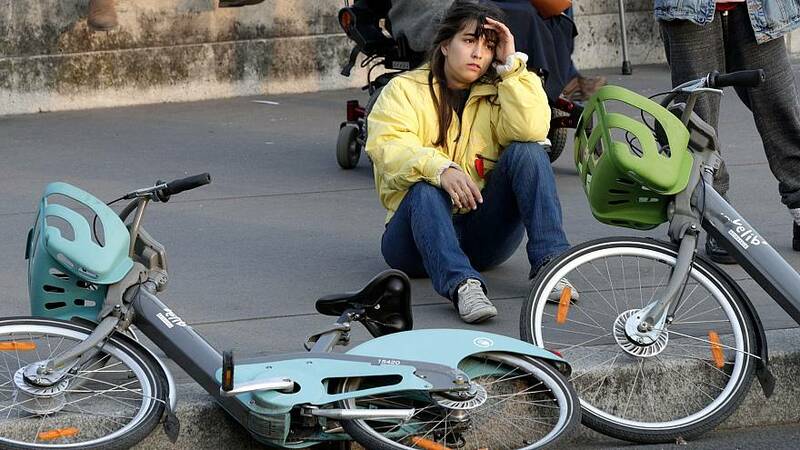 People stopped all around, in shock, and stood witness to the landmark's destruction. "It was an emotional experience. I see it every day on my way to home, it was so sad," Kang said. "I don't remember something like this ever happening. Notre Dame is the center of Paris. "President Donald Trump called the Notre Dame one of the "great treasures of the world" during an economic roundtable event in Minnesota. "[The cathedral] is beyond countries, that's beyond anything, that's part of our growing up, it's a part of our culture, it's a part of our lives," Trump said. 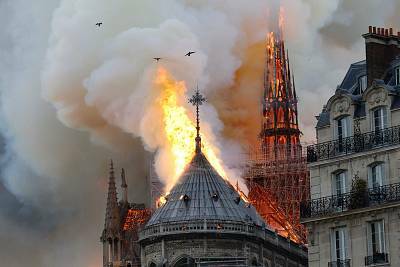 Cardinal Timothy Dolan, archbishop of New York, tweeted on Monday that he prayed for the Paris landmark after hearing of the fire. "I just went next door to our own beloved Cathedral, Saint Patrick's, to ask the intercession of Notre Dame, our Lady, for the Cathedral at the heart of Paris, and of civilization, now in flames! God preserve this splendid house of prayer, and protect those battling the blaze," Dolan wrote.Four hundred firefighters were on the scene, desperately trying to douse flames that were destroying one of France's most treasured sites.The New York Fire Department released a statement Monday expressing sympathy with the Paris Fire Brigade as they fought to quell the inferno. "Images of Notre Dame in flames are an awful sight to behold," the agency said. "The thoughts of the FDNY are with the members of @PompiersParis as they bravely battle this terrible fire in one of the world's most beautiful and historic houses of worship. "Former first lady and Secretary of State Hilary Clinton said in a tweet that her heart went out to Paris. "Notre Dame is a symbol of our ability as human beings to unite for a higher purpose—to build breathtaking spaces for worship that no one person could have built on their own," Clinton said. "I wish France strength and shared purpose as they grieve and rebuild. "People across the world began recounting their experiences and appreciation of the cathedral's beauty on social media. One Twitter user said that he first visited the church at 7 years old. "It's one of the most beautiful things I've ever seen, and I'd visit the cathedral each time I was in Paris just to be moved and astonished. This is heartbreaking," he wrote.Pop singer Camila Cabello wrote in a tweet Monday that she was devastated watching the cathedral burn. "I'll never forget walking in the first time in Paris and being in awe of the beauty of it," Cabello said.Construction of Notre Dame began in 1163 under the reign of King Louis VII, and the first stone was laid in the presence of Pope Alexander III.The landmark was not considered complete until nearly 200 years later, however, with the installation of flying buttresses and a stone fence surrounding the choir and the sanctuary, according to the website for Notre Dame de Paris.